Ah, yes, Ewoks. The very first thing to split Star Wars fans. No one is simply okay with the Ewoks. You love them or you hate them. And you certainly can’t ever, under any circumstances see the other side’s point of view. They’re wrong and that’s just how it is. They must accept it. I fall into the camp that likes the Ewoks. I was probably 3 or 4 when I saw Return of the Jedi for the first time, so I never had a problem with the Carebears from Hell. 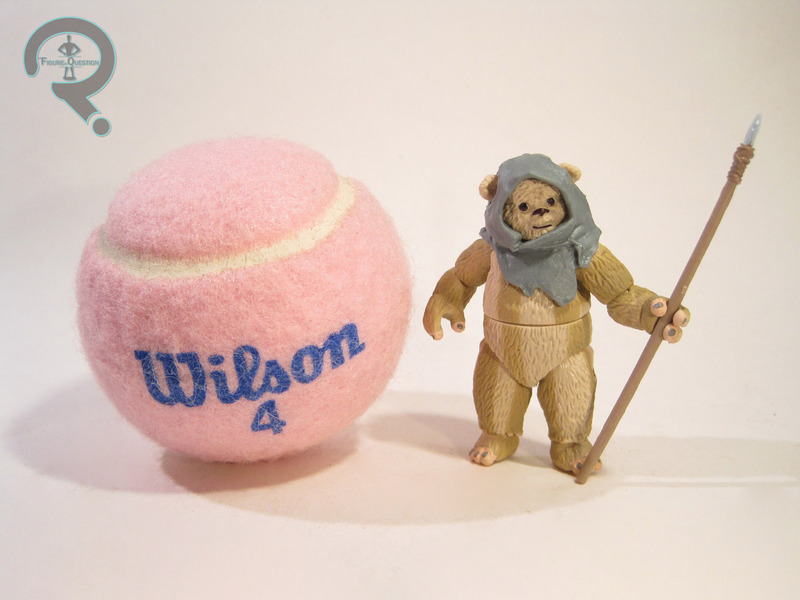 Thing is, I never actually had any of the Ewok action figures for some reason, even though Jedi was my favorite of the movies growing up and I had just about every other Endor themed figure. But, things change, so here I am reviewing some Ewoks. Yay! According to Wookiepedia (which I totally had to use to figure which of these two was which), Chubbray is “an Ewok who participated in the Battle of Endor alongside the ewok Stemzee.” Which I actually could have figured out on my own, just from this set. Hilariously, the entry on Stemzee reads: “Stemzee was an Ewok who participated in the Battle of Endor alongside ewok Chubbray.” That’s sort of the equivalent of two words using each other in their definitions. I’m honestly shocked that there’s not even some sort of EU stuff for them. I mean, there’s a freaking entry for Ice Cream Maker Guy! Obviously, these two have gone over looked for far too long. So, I’ll just have to give them some backstory myself. See? That wasn’t so hard! Chubbray is about 2 ¾ inches in height and he features 14 points of articulation. While that’s certainly more articulation than most previous Ewoks, the lack of elbows and knees do make the figure a little stiff. 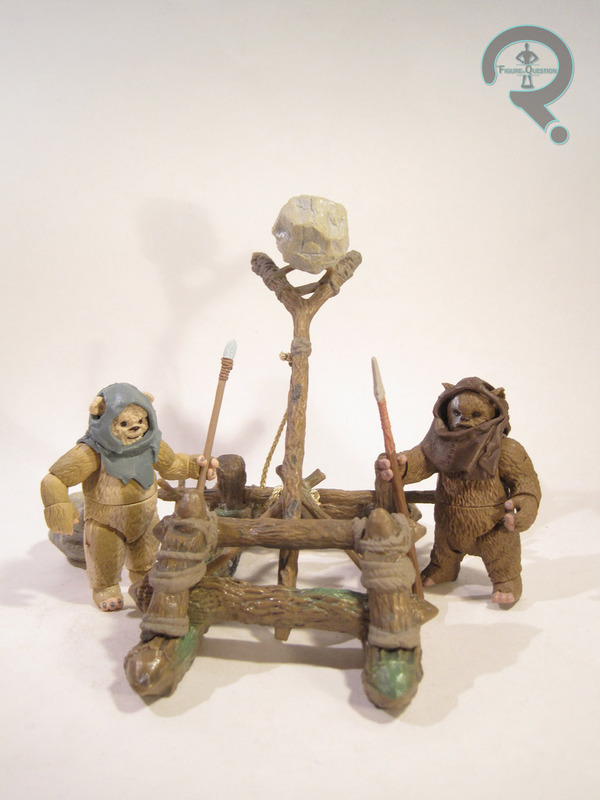 I don’t have an expert on the previous Ewok figures, so I don’t know if any pieces are shared here. Regardless, the sculpt is nicely done. It looks like the creatures from the movie, and there’s some very nice detail work on the fur and the head covering. About the only downside of the sculpt is that the joints are really visible. Chubbray’s paintwork is generally pretty clean, though, to be fair, it’s not the most complex paintjob of all time. Still, it’s all well applied and all the colors are well chosen. Chubbray includes a spear, which is probably just a normal spear, but I’m going to pretend it’s some sort of an energy spear that’s powered by some minutely scaled generator that Chubbray built himself. 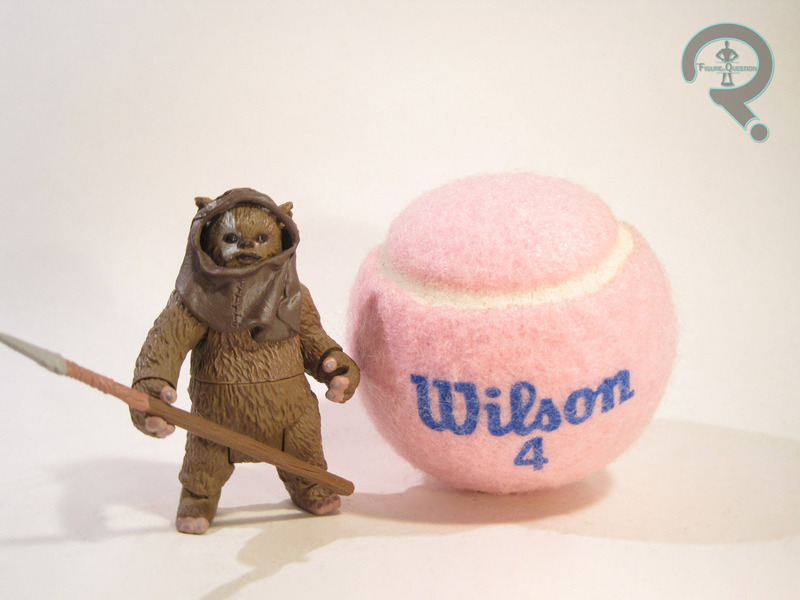 I mean, the greatest Ewok warrior that ever lived has to have a top-notch weapon, right? Aw, wasn’t that one kinda sweet? They’re so happy together! Stemzee is roughly 3 inches tall and features 20 points of articulation. Check out those elbow joints! Those are certainly a nice thing. Stemzee’s sculpt seems to be a more advanced one than Chubbray’s, which leads me to think that these two use bodies from previously released Ewoks. It’s a pretty good sculpt, with lots of fine detail work and such, and the articulation is even pretty smoothly worked in, which is good. Stemzee features a slightly more complex paintjob than Chubbray, and he’s a better figure for it. The colors look nice and everything is applied rather cleanly. Stemzee includes a spear, which is different from the one included with Chubbray. Oh no! We killed off Leslie the Catapult! The tragedy! So, the catapult isn’t really a figure, but it is the centerpiece of the set, so it gets its own section. It’s about 3 inches tall, 4 inches long, and 2 inches wide. It doesn’t actually have any articulation to speak of, but you can wind the winch up to pull the arm back for a throwing action. It doesn’t work fantastically, but it’s okay. The sculpt of the catapult is rather nicely detailed, and it actually does look a little like it was constructed out of something that at least resembles wood. It’s like imitation wood. There’s also some nice work on the ties and such, which helps to further illustrate the “built from trees thing.” The paintwork on the catapult is pretty decently handled, with lots of nice accent work to bring out the details of the sculpt. 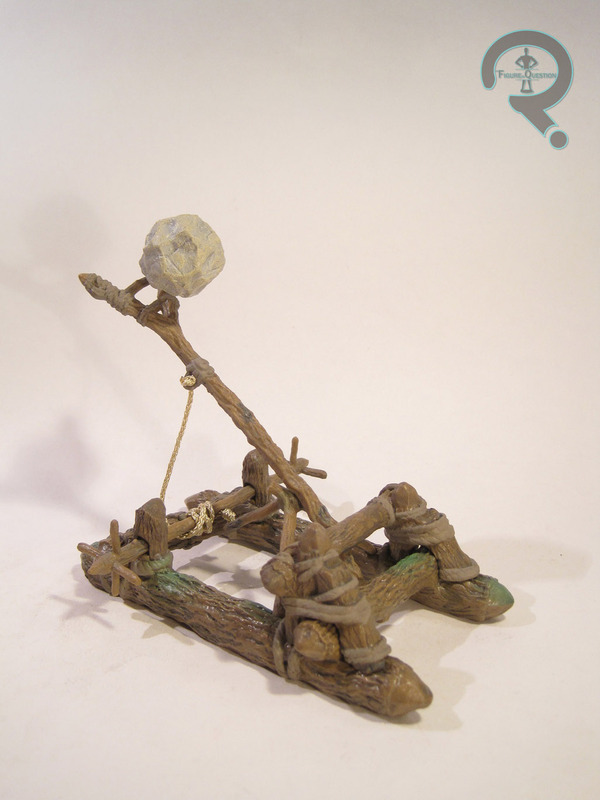 The catapult includes two large rocks, each with a small hole on the bottom so they can be placed on the catapult’s arm. This set was picked up while I was killing some time at a K-Mart with my Super Awesome Girlfriend (it was the same trip which got me the FOOT NINJA!!!!). We were wandering through and I noticed this set in the clearance section for about $10. With a little encouraging from SAGF, I figured “why not?” and went for it. I can kinda see why the set might get clearanced. It’s not the most thrilling set, and I can imagine the whole “not being able to see what you’re getting” thing probably turned some people off. Still, I kinda feel bad for the poor set. It’s really not a bad set, and at clearance prices it’s a fantastic way to get a couple of Ewoks. Plus, there’s a really cool catapult! Hey Guys! Some of you may have noticed yesterday’s Black Knight review had a link to a bio and illustration for the character. I realize that some characters might be a bit lesser known to some readers, so I thought I’d start doing a bit of a supplemental feature called “Backstories” that will provide a bit of basic info on such characters. I’ll be linking the Backstories in the appropriate reviews as they come along, plus they’ll also be available to view through the new “Backstories” tab at the top of the page.